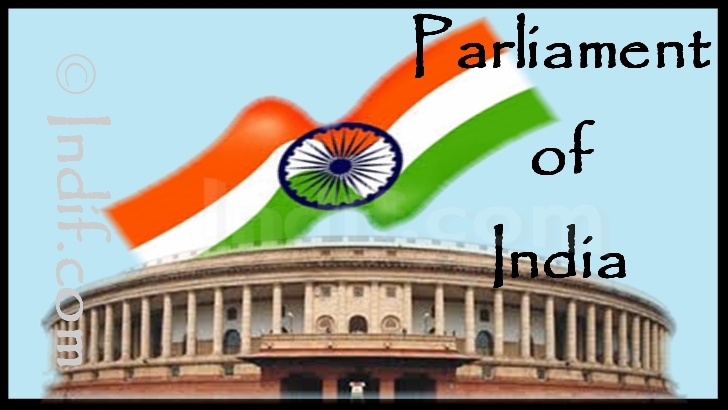 Parliament, is the national legislature of Indian Union. The Hindi term for Parliament is Bhartiya Sansad (भारतीय संसद). The Indian Parliament comprises two Houses – Lok Sabha (House of the People), and Rajya Sabha, (Council of the States), and the President of India. This kind of system, with two Houses, is called a bicameral legislature. Parliament has four primary functions: to make laws, to sanction government expenditure, to oversee the work of the government, and to represent the interests of the people. In the Indian system, the Council of Ministers are also Members of Parliament (that is, there is an overlap of the legislative and executive functions for several members) For those members who are part of the Council of Ministers, there is an additional responsibility of the executive as compared to those who are not in the Council of Ministers. Oversight responsibility: To ensure that the executive (i.e. government) performs its duties satisfactorily. Representative responsibility: To represent the views and aspirations of the people of their constituency in Parliament. Not less than 30 years of age in the case of the Rajya Sabha and not less than 25 years in the case of the Lok Sabha. A voter for any parliamentary constituency in India, but in the case of the Rajya Sabha a candidate must be registered as an elector in the State or Union Territory from where he is to be chosen. Holds any office of profit under the government other than an office declared by Parliament by law not to disqualify its holder. Has ceased to be a citizen of India. If a person has been convicted, among other things, for promoting enmity between different groups or convicted for the offence of bribery. Has been punished for preaching and practising social crimes such as untouchability, dowry, or sati, then he is disqualified from being chosen as a member. If the person is convicted for an offence and sentenced to imprisonment; and for a government servant dismissed for corruption or for disloyalty to the State. The period during which the House meets to conduct its business is called a session. The Constitution empowers the President to summon each House at such intervals that there should not be more than 6-month's gap between the two sessions. Hence the Parliament must meet at least twice a year. In India, the parliament conducts three sessions each year. Budget session: In the months of February to May. Monsoon session: In the months of July to September. The Rajya Sabha is the upper house of the parliament and it is constituted from the representatives from the states or the constituent units of the Indian Union. It is a permanent body, one third of its members retire after every two years. It's maximum strength is 250. Out of these , twelve members are nominated by the president from well known personalities in the realm of science, Art, literature and social services. Rest are 238 representatives of the states and union territories are elected,roughly in proportion to their population; each State is, however, represented by at least one member. Lok Sabha is also known as the "House of the People" or the lower house. The Lok Sabha, as the name itself signifies, is composed of representatives of the people chosen by direct election on the basis of adult suffrage. The maximum strength of the House envisaged by the Constitution is 552 – upto 530 members to represent the States, upto 20 members to represent the Union territories and not more than two members of the Anglo-Indian Community to be nominated by the President if, in his opinion, that community is not adequately represented in the House. The total elective membership of the House is distributed among the States in such a way that the ratio between the number of seats allotted to each State and the population of the State is, so far as practicable, the same for all States. The qualifying age for membership of the Lok Sabha is 25 years.